The Raffles Hotel Singapore is a legendary symbol in the country. Surrounded by lush and exotic gardens, the hotel has an illustrious history dating back to the 19th century. 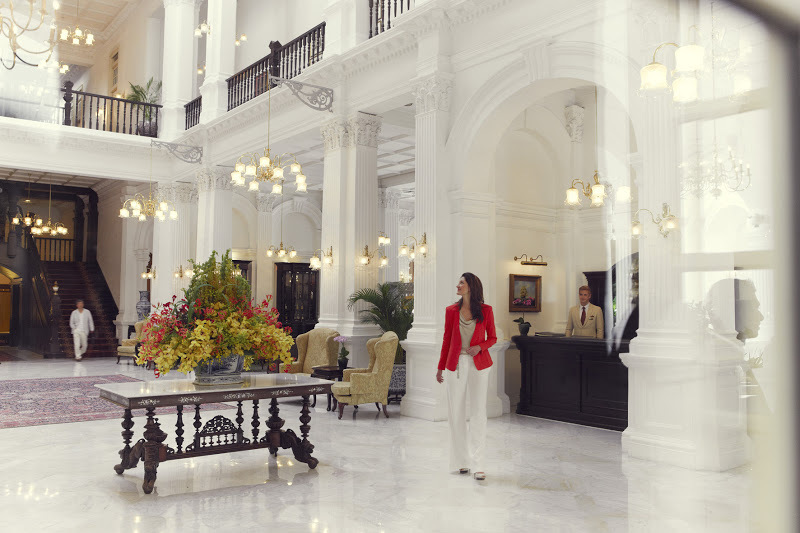 With 103 suites and 18 distinctive restaurants and bars, its rich history is preserved and told through its colonial-style design and architecture. Declared a National Monument in 1987, the hotel has grown from strength to strength and was recently the hotel of choice for HRH Duke & Duchess of Cambridge on their royal tour to Malaysia. Founded in 1887 but recently restored in 1991, it is well-known for the Long Bar where you throw your peanut shells on the floor and can drink a 'Singapore Sling' in the very place that the tipple was originally created. On arrival the iconic bellmen proudly stand at the entrance of the hotel dressed in their finery welcoming guests. 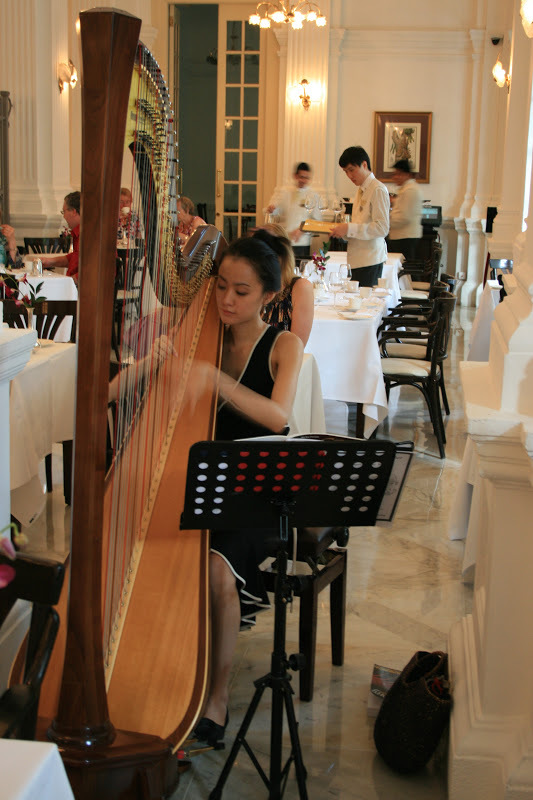 Renowned for providing impeccable service that harks back to a bygone era, the hotel is seen to many visiting tourists as an absolute must when visiting Singapore. So for me no trip to Singapore would be complete without visiting this iconic and much-loved hotel, and one thing that I just had to do was experience the afternoon tea which upholds a truly British style. As luck would have it, my timing couldn't have been more perfect as in honour of the hotels 125th anniversary they were presenting a special champagne afternoon tea. Afternoon tea is held in the Tiffin Room. The Tiffin Room’s décor and ambience reflects the hotel’s glory days from the turn of the century to the 1930s. Square teak tables, including many Raffles Hotel originals, are combined with "palm back" bentwood chairs. The first thing that caught my eye was the neutral colour tone of the wall and the white table linen. The room is filled with natural light that glimmers through from the large doors at the entrance. I later found out that the design of the tables, chairs and the smart waiters uniforms are copied from Raffles early photographs. Sitting down I immediately noticed how elegantly the table was laid with fine china and cutlery. The brisk waiters, dressed in their smart white jackets, began to serve the guests, first offering the option of a glass of limited edition Anniversary Billecart-Salmon Brut Reserve champagne that was bottled exclusively for this milestone. Billecart-Salmon is known for its elegant fully rounded cuvées with a seemingly ageless style. Established by Nicolas François Billecart and Elisabeth Salmon in 1818, Billecart-Salmon remains family owned and operated and is now helmed by the seventh generation. The champagne was light, fine and truly harmonious. As we sipped on the champagne our waiter then delivered a wonderful three-tier stand which sat ever so elegantly in the centre of our table. The special anniversary selection included a raspberry tartlet, hazelnut dome with gold leaf, lemon bar with meringue (which was particularly delicious), raspberry and rose cake and a chocolate and passion finger. At the bottom of the stand was a selection of delicate finger sandwiches. Guests are also left to help themselves to a large buffet selection at the end of the room. Buffet style afternoon tea is very popular in Singapore, with most afternoon teas offering the service. It really does make sure that guests are more than happy with the wide selection and of course satisfied with the option to indulge as much as one would like! The buffet spread included a Dim Sum Station, which is a particular favourite of mine. The Dim sum selection was fantastic! Mini Char Siew Pau (Chicken), Spinach Dumpling (Seafood), Crystal Dumpling (Vegetarian), Jade Dumpling (Chicken and Shrimp) to name just a few, accompanied with a selection of dipping sauces. All freshly made and steaming hot, there is nothing better than having the opportunity to try something new and finding it to be incredibly tasty there was plenty more to enjoy at the buffet, including a wide selection of fresh tropical fruits and Victoria sponge and Battenburg cake, a truly British touch! Whilst enjoying my afternoon tea, the waiters breezed around the room making sure that everyone was truly satisfied and enjoying their experience. The tea was topped up seamlessly to the soundtrack of a harpist that plays throughout the afternoon. This made for a truly refined way to get a taste of Singapore's post-colonial side. The tea selection is not large and a menu is not provided but the waiters are more than happy to help you with your choice. With a herbal infusion and favourites such as earl grey and english breakfast, the staff go above and beyond to make sure that all your needs are catered for. But of course no afternoon tea would be complete without a scone! Baked to perfection and beautifully warm, the scones where delivered on a silver tray and accompanied with thick clotted cream and a selection of two jams rose petal and passion fruit. Another lovely touch to the afternoon tea was the Anniversary Macaroons that where brought to our table throughout the course of the afternoon. The earl grey and rose macaroons where just how they should be and the melt in the mouth lavender, vanilla and raspberry eclairs were the perfect finish. On the whole, the Tiffin Room is certainly a wonderful place to visit for an afternoon of high tea and to experience the elegance of Raffles. The service is exceptional and the food is divine! The degree of artistry and care that has gone into creating the afternoon tea is second to none. Raffles afternoon tea is the perfect place to escape, relax and enjoy with it's beautiful surroundings. I can assure you that you will leave extremely satisfied! Reservations are highly encouraged for afternoon High Tea at the Tiffin Room. Gentlemen are requested to be in business shirts or collared t-shirts, paired with appropriate long pants. Jackets are not necessary. Dresses, skirts or trousers are recommended for ladies. Patrons are advised that singlets, shorts, bermudas, sandals, slippers and pool attire are not permitted in the restaurant. This review just made me go into a daydream...... The pictures are lovely, the way its written makes me want to try that delicious sounding food ! Thankfully I will be visiting Singapore in March and this I just have to do! 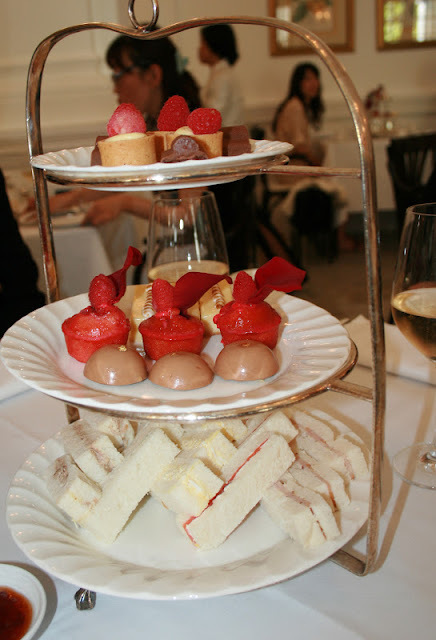 thank you for giving me the idea :) Look forward to reading your next afternoon tea review.